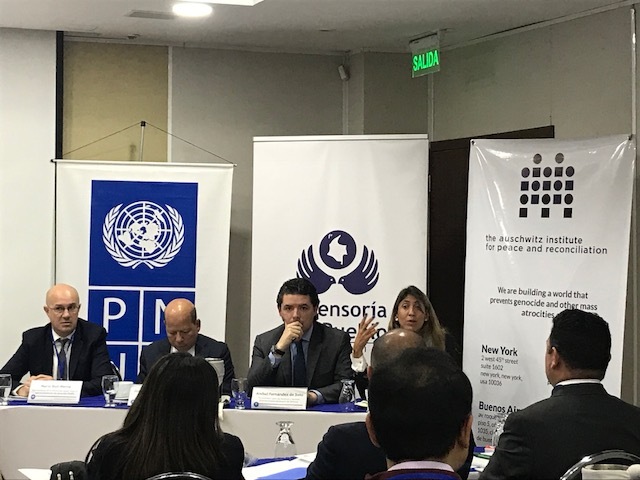 On March 14 and 15 of 2018, the first national training seminar on the topic of tools for the prevention of mass atrocities and early warning systems was held in Bogotá, Colombia. The event was organized by the Auschwitz Institute for Peace and Reconciliation (AIPR) and the Office of the Ombudsman of Colombia, in collaboration with the Swedish Embassy in Colombia and the United Nations Development Programme (UNDP). The two-day seminar welcomed the participation of 30 public officials representing different national-level institutions in Colombia. These included the Office of the Ombudsman, Ministries of Foreign Affairs and Defense, National Attorney-General, the Presidential Office for Women’s Equality, National Police, National Prosecutor-General, and the National Army, among others. The program began with an opening ceremony, which featured contributions made by representatives of the organizing parties. Colombian Vice-Ombudsman Jorge Calero, Vice-Minister of Defense Aníbal Fernández de Soto, Director of AIPR’s Latin American Program, Eugenia Carbone, and Mario Buil-Merce, Political Affairs Officer of the United Nations Office of the Special Advisers on the Prevention of Genocide and on the Responsibility to Protect (UN OSAPG) each contributed a short series of welcoming remarks. Over the course of the first day, representatives of the Auschwitz Institute shared introductory modules on the essential concepts involved in a prevention-centric approach to confront genocide and mass atrocities. AIPR was also responsible for delivering a presentation on existing international-level legal tools for confronting these crimes through the use of early warning systems. Mr. Buil-Merce of the UN OSAPG led modules on conceptual elements and practices related to the use of early warning mechanisms as well as the role played by the United Nations in the prevention of genocide and other atrocity crimes, more broadly. 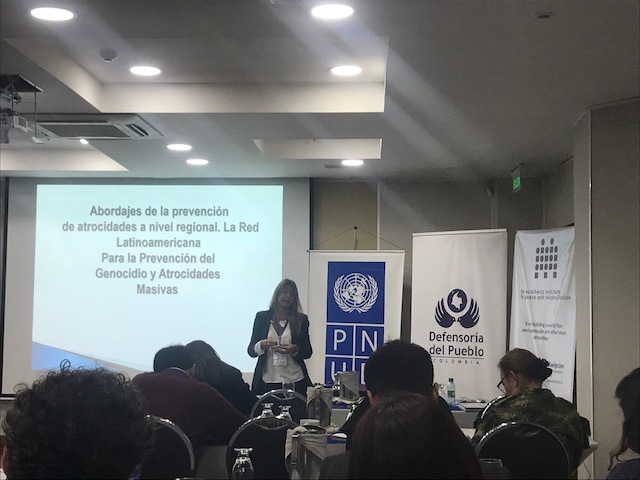 Additionally, a module was dedicated to a presentation of the Latin American Network for Genocide and Mass Atrocity Prevention and other regional-level and national-level initiatives as necessary tools to reinforce existing mechanisms within member states of the Network. The second day began with “Becoming Evil: How Ordinary People Commit Genocide and Mass Atrocities”, which was followed by an opportunity for interactive dialogue on the cultural trauma and the related challenges in terms of processes of transitional justice. The program also included a segment on the importance of risk evaluations within early warning systems, as well as an international case study from Brazil on the protection of indigenous groups. The latter half of the day was dedicated to contextualizing Colombia’s peace process and the current state of the early warning system. The parameters of the new system were presented, as well as CIPRAT’s role as related to the work of the Office of the Ombudsman and Ministry of the Interior. The seminar’s final activity took the form of an interactive working group exercise dedicated to analyzing the challenges and opportunities presented by the new early warning system from a prevention perspective. The day closed with a certificate presentation ceremony, led by the organizing institutions. On the day preceding the seminar, the Colombian Office of the Ombudsman convened a forum with the goal of raising awareness on the consequences of atrocity crimes, prevention factors, processes of historical memory, and the victims’ capacity for resilience. The event, titled “Genocide and Mass Atrocity Prevention as a Tool for Peacebuilding in Colombia,” welcomed more than 200 individuals from a range of government institutions and civil society organizations. The opening remarks were provided by Carlos Negret Mosquera, Ombudsman of Colombia and by the Ambassador of Sweden in Colombia, Tommy Strömberg. AIPR joined the UN OSAPG representative for a conversation on the importance of the efforts in prevention in Latin America. At the forum, opportunities were also presented for dialogue between victims of historical and symbolic massacres of the armed conflict, followed by a discussion on processes for the construction of historical memory and resiliency as a tool for peacebuilding and reconciliation. 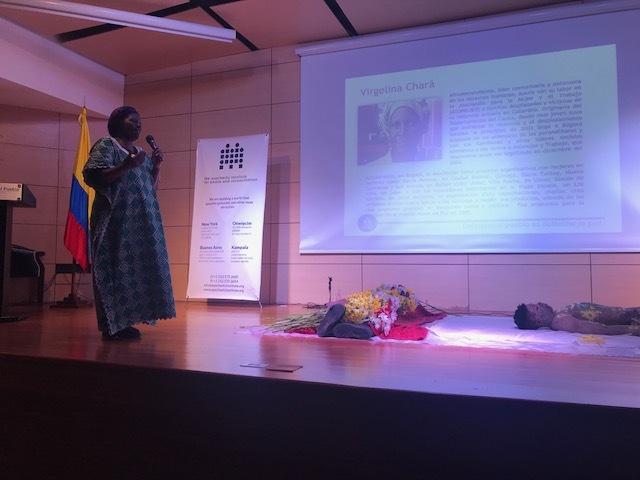 The closing of the forum was held by Virgelina Chará, Director of Asociación para la Mujer y el Trabajo (ASOMUJER), who led a participative artistic module that paid homage to the victims of the armed conflict in Colombia. For more information on the training seminar, please view the article on the event (Spanish) published on the website of the Colombian Office of the Ombudsman.